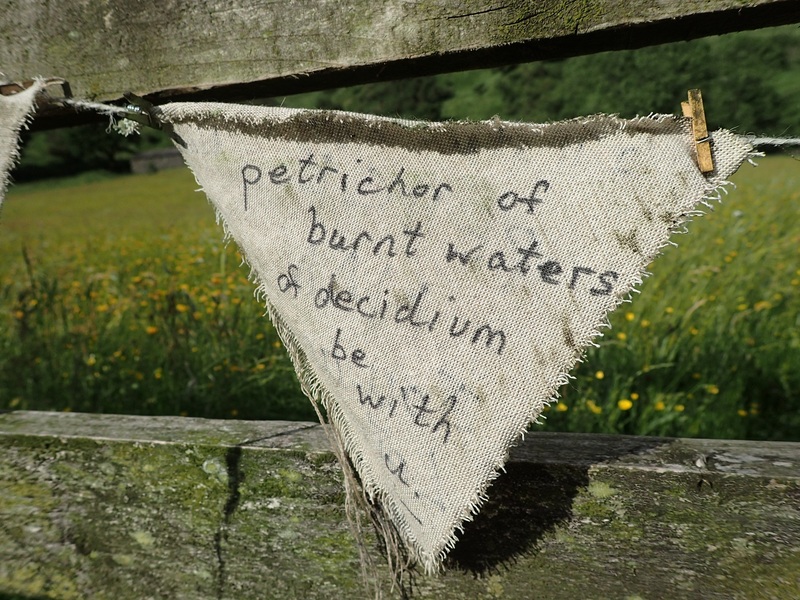 I have learnt a new word from the bunting in the meadow. Someone, anonymously, left a message and introduced me to the word ‘petrichor’. Thank you! I don’t, however, know what decidium means. Any suggestions? The meadow is always open. A public path runs alongside Borrow Beck taking you into the heart of the valley. But not many people come – this is a hidden gem of Cumbria. When I invited a group of adults in to share the space and explore poetry, everyone left with smiles and inspiration. 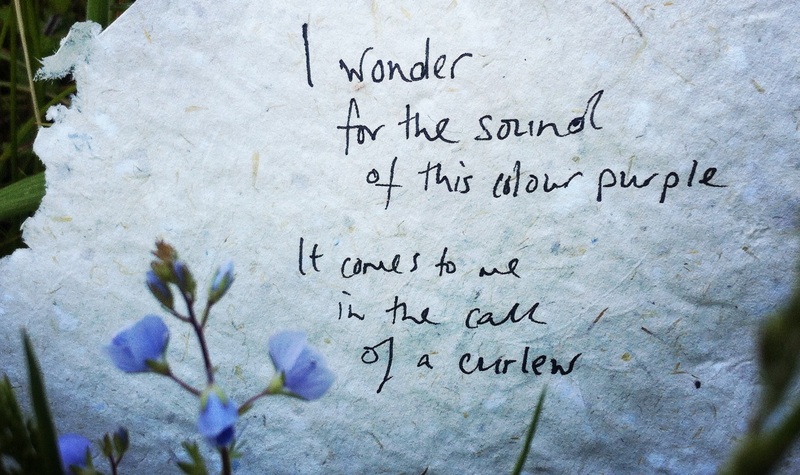 I included a playful poem that was uncovered while we were sitting under the sycamore trees in my last blog post. 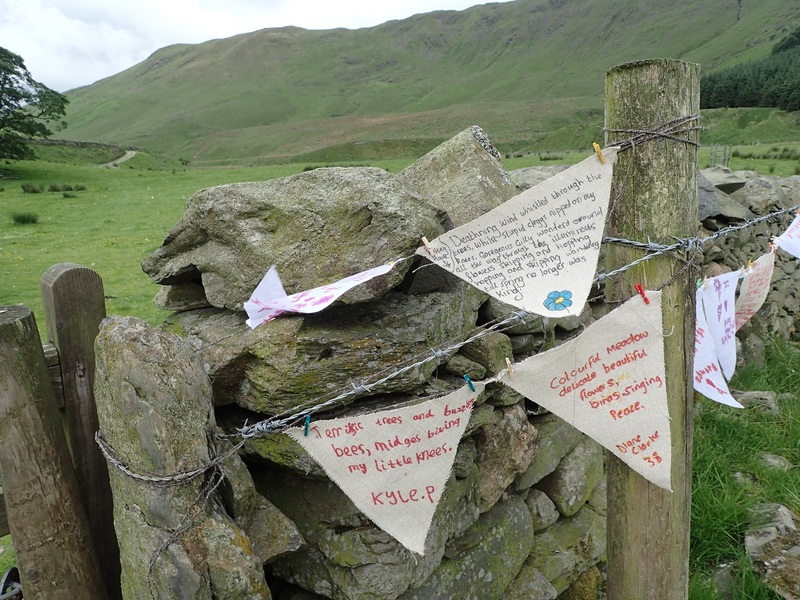 The day after that leisurely sun-kissed poetry sharing, thirty children from Tebay school walked in to High Borrowdale. They arrived at the first meadow gate after more than an hour’s walk, fizzing and buzzing with energy. They seemed to have pushed the early morning mist westwards in their wake and as the day got warmer, their curiosity grew. 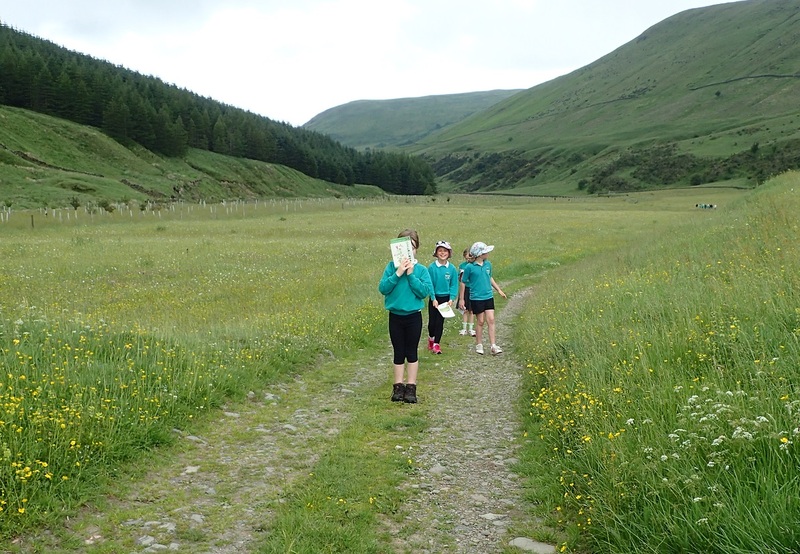 The young meadow detectives hunted out flowers, conjured up rich descriptive terms for them; they stopped and listened, and made sound maps; they drew and wrote on bunting; they ran from clegs. Never hide from their beauty. On the hill in Borrowdale. A group of lonely stars dancing. To the sounds all around. And we run home through bugs. The language of the meadow is seductive, suggestive. 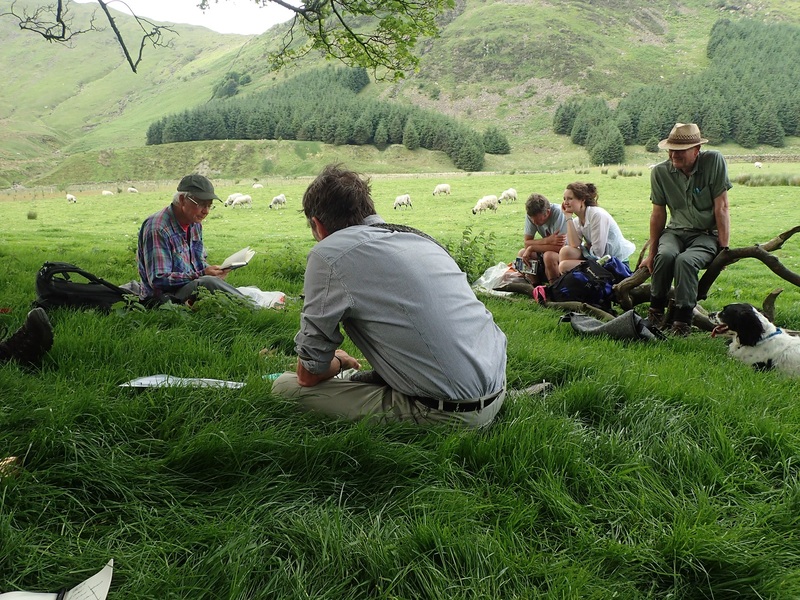 I’ve been reading through the High Borrowdale ecological survey from 2014 and playing with the names out loud and in my mind – is that strange? I don’t think so. Some of them feel so good to roll around your tongue. Sorrel, yarrow, fecue, bent. Some paint instant pictures. Dog violet, melancholy thistle, meadow foxtail. If the names were all in Latin they might make scientific sense and allow classification, but they would lose the sense of our connection to them. The people who named the plants we know today did so laden with stories, intention, local knowledge. Selfheal and eyebright speak of their use. 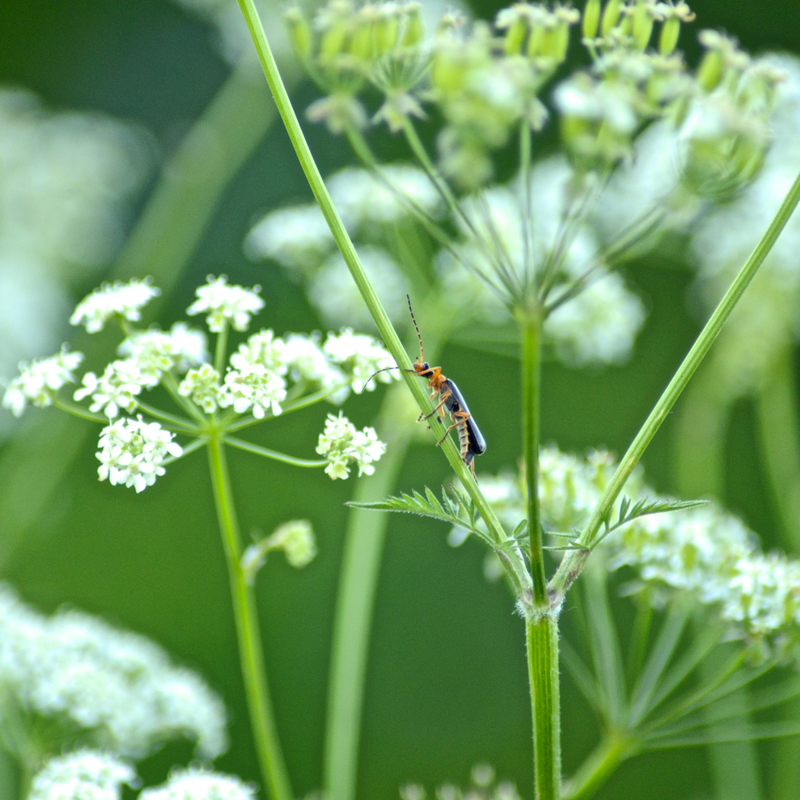 Then there are flowers like lady’s mantle, ragged robin and butterfly orchid that are named for their appearance. The names of grasses feel a little more simple, giving down-to-earth descriptions: sharp-flowered rush, rough meadow-grass. I like the sound of sweet vernal grass and crested dog’s tail, and the name Yorkshire fog instantly conjures up the scene of a misty field top on a chill Yorkshire day. There’s something mystical, something mythical even about the names we ‘commonly’ give the plants around us. And I enjoy the way that no plant has one, single, definitive name. Common mouse-ear is also known as chickweed or starweed – the last seeming most appropriate with the delicate white flower opening like a silk star. I’ve just been to visit a teacher at one of the schools I’ll be welcoming into the meadow, and we leafed through some wildflower cards that listed names for each plant. Imagine we were to name them all again, reflecting our own encounters with them, perhaps for the first time, with the striking up of a new relationship. 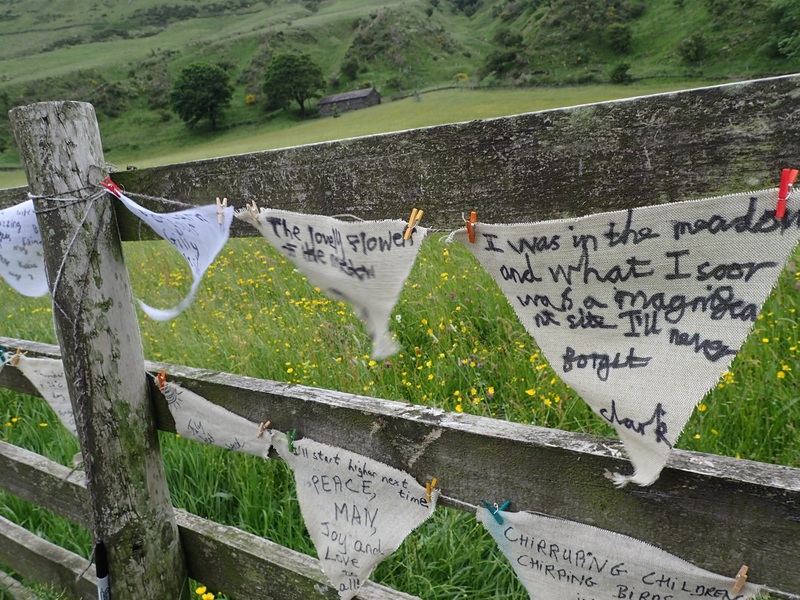 When I’m in the meadow I will be inviting visitors to do just this – the new names will be catalogued on paper made using the river water and the mulch of fallen leaves, stalks and petals. In the invention of new names our thoughts, like bees, will flit and buzz as they are drawn to brightness, seduced by scent, driven by something beyond reason. I hope we’ll be surprised by some of them and as we gather them, the new names will become part of the meadow poetry. Thank you Rob Fraser for the wonderful images. Beautiful.